Two-day tour around the Izu Peninsula, a popular resort area that is located just 100 kilometers southwest of Tokyo. On this tour, you will be able to enjoy hot springs, visit many spectacular sightseeing spots with beautiful beaches and mountains, and taste fresh seafood. On Day 1, you will visit Kakita River Spring Sources and have lunch at Mishima, then continue to Mishima Wasabi Factory and the Jogasaki Coast. Day 2 begins with a visit to Shirahama Jinja Shrine or Ryugyu Sea Cave (depending on your departure month), then will head to Minamiizu for shopping. Later, you will enjoy the Irozaki cruise ride, have Izu cuisine lunch at a local restaurant, before ending the day spending some time at Kohunegahama beach and at the seafood shop in Numazu before heading back to Tokyo. This tour departs Shinjuku at 8:50am and will head to Izu Peninsula by bus. The trip continues by visiting Jogasaki Coast, one of the highlights of the tour. The coast offers impressive views of the irregular cliffs and stone formations that surround it. You will have around 40 minutes there, including time for walking on the thrilling suspension bridge. With sightseeing for the day complete, it's time to unwind at Hotel Shinayoshi in the Izu Atagawa Onsen area, where you will enjoy a Ise lobster and abalone sashimi dinner. Stay overnight at the hotel. You will have about a half an hour at Shirahama Shrine (or Ryugyu Sea Cave) before leaving for Minamiizu, where you will stay for about 30 minutes to shop for aloe products. 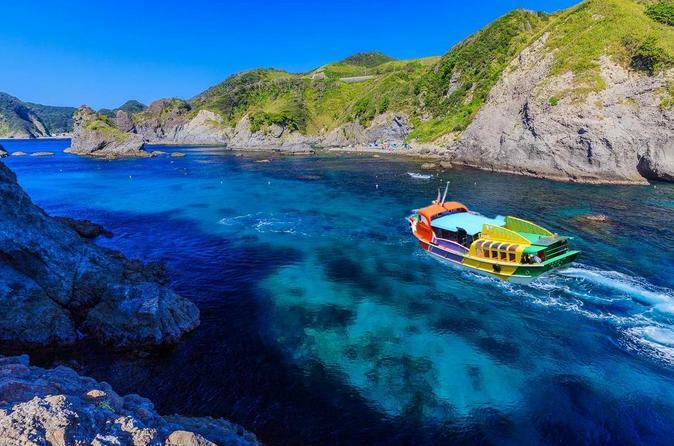 Afterwards, the trip continues with a 30-minute sightseeing cruise, during which you will be able to enjoy the attractive view of Cape Irozaki located at the southern coast of Izu Peninsula. After the cruise ride, you will have 50 minutes for a red bream lunch at "Okada"- A Taste of Izu, a local restaurant that offers local fresh seafood. Thereafter, you will visit another beautiful hidden beach, Kofunegahama Beach, which is still largely unknown to mass tourism. There, you will have about 30 minutes to catch an impressive view of its red torii gate and Mt. Fuji in the distance. The last stop will be in Numazu for 20 minutes to shop for seafood products before heading back to Shinjuku. The approximate arrival time is 19:10.